Acorns are the most important wildlife food in Midwest deciduous forests ("the ecological equivalent of manna from heaven"; McShea and Healy, 2002; see reference below) Mast is a term used to describe the hard fruit of various trees such as beech or oak. Oaks as a group produce lots of acorns only every three or four years, and a high production year is called a good mast year. Last year was a good mast year at Pleasant Valley Conservancy for oaks of the red oak group (red, black, and Hill's) and this year is a good mast year for oaks of the white oak group (bur, white). (There were essentially no white or bur oak acorns last fall.) 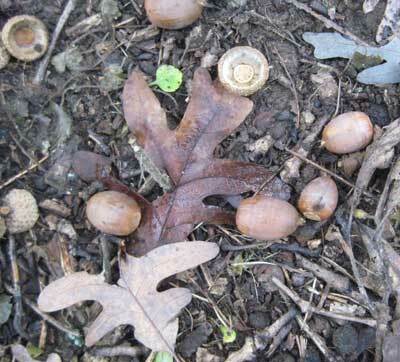 Now is the season when acorns are coming down, and near big oaks the ground is covered with acorns. Kathie and I picked up about pound of acorns under a single large white oak within a few minutes. The oaks have an interesting life cycle. 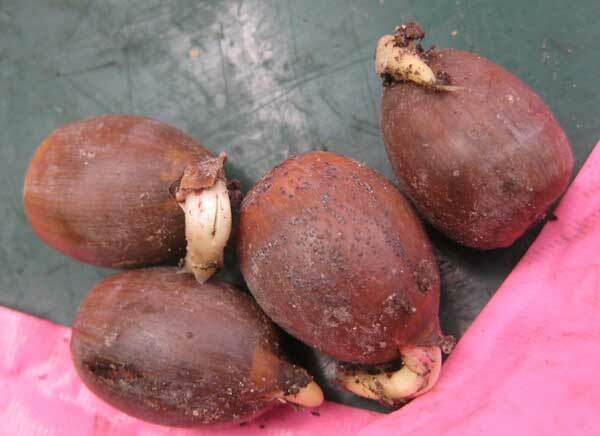 Soon after the acorns fall they start to germinate, sending out roots but no shoots. Root growth continues until cold weather intervenes. It begins again in the spring, at which time shoot growth also commences. This procedure may speed up tree growth in the spring and at the same time prevent the shoot from being damaged by the cold. According to U.S. Forest Service sources, sound acorns have between 50 and 99% viability. 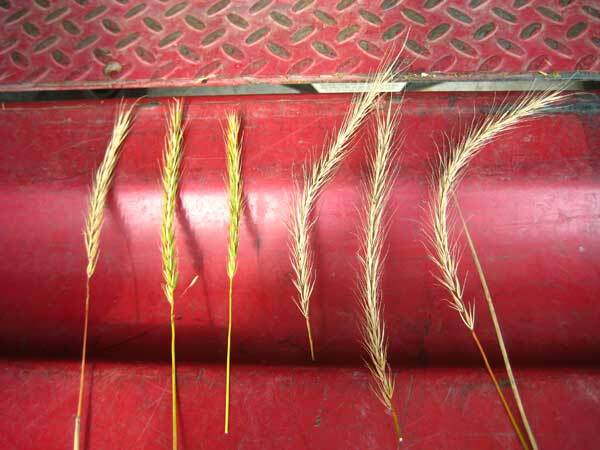 An interesting aspect of masting is that it is a population phenomenon. In general all the oaks in a stand exhibit high or low acorn production the same year. Animals that make considerable use of mast exhibit population fluctuations that track the changes in mast production. The masting phenomenon is characteristic of trees with large-sized seeds, and is thought by ecologists to have evolved as a means of ensuring sufficient seeds for the reproduction of the tree species. In high mast years, when large numbers of seeds are produced, there are insufficient animal seed eaters to consume them all, thus leading to successful establishment of new tree seedlings. Because there are more low-mast years than high, populations of acorn eaters are controlled by the low mast condition. In one study, each species of oak had its own good mast years, which were different from those of other species. Over a five year period, there were three poor mast years, one moderate mast year, and one very good mast year. The cycle of masting will vary not only with the species, but with the location and various environmental variables. High seed production provides an enormous input of food for seed consumers in forests. High-mast years lead to abundance of body fat in mammals, thus aiding in their survival during harsh winter conditions. Because rodents are short-lived creatures, their populations tend to fluctuate with quantities of mast. On the other hand, deer, which are longer lived, benefit from the high mast situation but do not exhibit the sharp population fluctuations that small mammals do. Despite extensive research on masting in oaks, there is no single explanation for the phenomenon. Weather is an important factor, but how does it influence masting? Possible environmental factors include late spring freezes that might kill oak flowers, variations in the efficiency of pollination, the initial size of the female flower crop, and conditions that might affect flower survival. Larger trees produce more acorns than smaller ones, although not all large oaks are good acorn producers. Our observations at Pleasant Valley Conservancy seem to show that the oaks of the same group (red or white) all mast together. McShea, William J. and Healy, William M. 2002. Oaks and acorns as a foundation for ecosystem management. pp. 1-9 In McShea, William J. and Healy, William M (editors). Oak Forest Ecosystems: Ecology and Management for Wildlife. Johns Hopkins University Press, Baltimore. This is peak fall color for shrubs and a perfect time to canvas for areas that need to be controlled. Sumac is the main culprit. 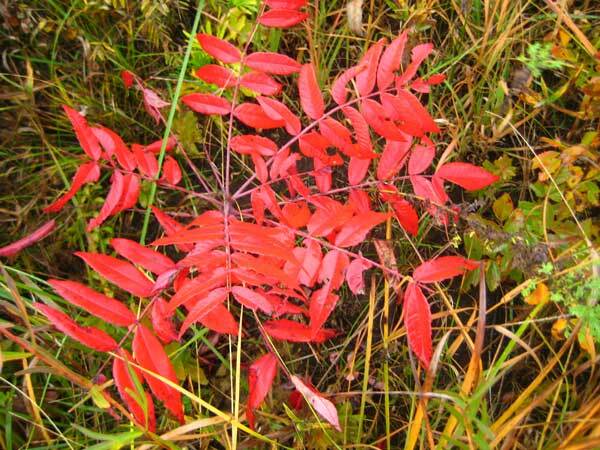 Once you start looking for sumac color, you realize how extensive this highly invasive shrub is. Yesterday I spent the morning (in a light rain!) at Black Earth Rettenmund Prairie locating sumac areas that need to be dealt with. Our goal at Rettenmund is to eradicate all sumac, likely a 4- or 5-year job. Sumac has been a problem at Rettenmund since the Nature Conservancy first started restoring in 1986. Attempts to control it by mowing and burns have been unsuccessful. According to the recent scientific literature, herbicide is the only solution, and my work over the past several years has confirmed this. Sumac is an impressive clone former, and left unchecked can take over a natural area. One Great Plains prairie I heard of had become almost 50% sumac! 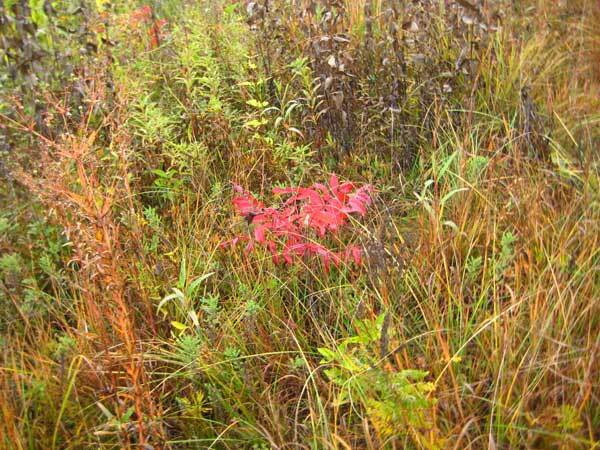 Because sumac causes deep shade, the native prairie flora can be completely eradicated. Herbicide can be used in two different ways. In the spring we foliar-spray with Garlon 3A all resprouts that have come up after the early burns. This is very effective, and with care there is no damage to nearby prairie plants. However, not all sumac shoots come up at the same time, and because they are small, some can be missed. But at the same time one can spray bramble, honeysuckle, and buckthorn resprouts. The second way we use herbicide with sumac is as a basal bark treatment (Garlon 4 in oil). This can be done any time of the year, and with care there is no peripheral damage. However, we don't really have time during midsummer to deal with sumac since we are busy with sweet clover. 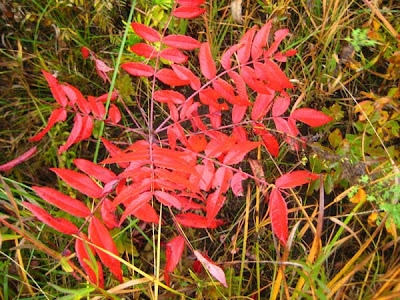 The off-season (late fall through early spring) is an ideal time to basal bark sumac. At this time of year, all the leaves are off, and the native vegetation has senesced, so that the naked stems are easy to get at. However, at this time of year finding clones, especially small ones, is difficult. This is where the fall-color canvas procedure enters the picture. While canvassing a prairie, I take GPS coordinates of each clone, and make notes of its extent. Yesterday, I located 16 clones at Rettenmund Prairie, mostly greater than 20 feet in diameter. Obviously, we have some work ahead of us. In addition to locating clones, it is also useful to locate individual plants that are present scattered across the prairie (see photo below). Each of these plants is a potential clone former, and should be treated with herbicide (basal bark) now. Finally, I should emphasize that you cannot eradicate a sumac clone with a single herbicide treatment, no matter how thorough. The underground rhizome network is not all killed, and root suckering is a major problem. Therefore, one must return to each clone the following growing season. Early in the season one can foliar spray. Later in the season, it is preferable to basal bark. At Pleasant Valley Conservancy we have found that it is possible to eradicate sumac clones, but you must keep coming back, at least twice, perhaps three times. 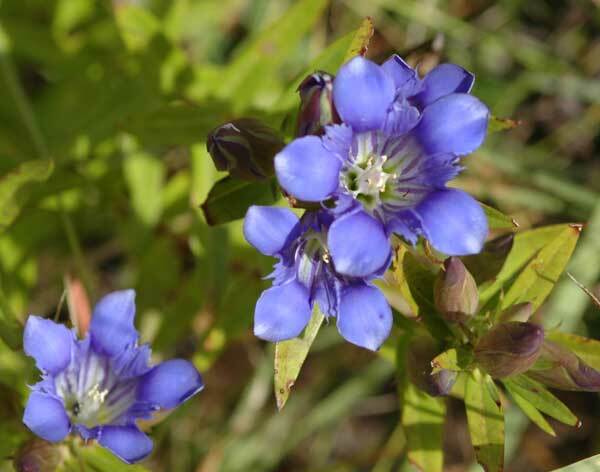 For some years we have been unsuccessful in growing prairie (downy) gentian (Gentiana puberulenta), but suddenly we have six or seven good areas in the Ridge Prairie. This small planted prairie, now in its sixth growing season, has turned into a highly diverse site. Prairie gentian, with a C value of 9, is fairly uncommon in Wisconsin, although I know of three prairie remnants where it can be found. According to Cochrane and Iltis, "This gorgeous species, so characteristic of prairies, deserves protection." Curtis considered it the most beautiful of all gentians. It is possible that it has been growing in the Ridge Prairie for some time and was missed, as it is a tiny plant nestled among the tallgrass prairie. It is the latest of the gentians to flower, and does so at a time when the prairie is choked with tall plants. You can't see it from a distance; you have to stumble on it as you are walking through. Marci found the first specimens while collecting seeds. Kathie immediately found three other small patches, and I found a couple more. Fortunately, I had my Nikon with me, with a macro lens. In the past Kathie had tried unsuccessfully to grow prairie gentian in the greenhouse. Strange then that these Ridge Prairie specimens arose from seeds that we had just "thrown out." We think the quality of the seed must vary considerably from year to year. Presumably 2005, when the Ridge Prairie was planted, must have been a good seed year. The seeds had been hand planted in a small area that Kathie had reserved for special forbs. Yesterday was a great day for seed collecting (until the rain started at 3 PM!). My job was to collect Virginia wild rye (Elymus virginicus), a nice rye grass that is relatively well behaved in a restoration. 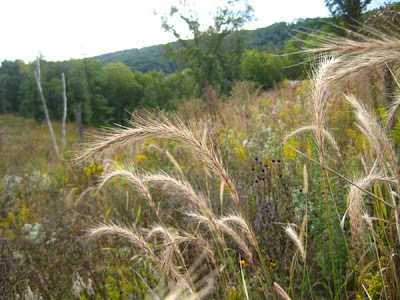 It is more of a savanna than a prairie grass, although it is sometimes found in prairies. It is relatively short lived, and at Pleasant Valley Conservancy it is now completely absent from several areas where it was once widespread (e.g. the Crane Prairie). The East Basin is our newest planted prairie, and is now in its second growing season. Virginia wild rye was included in the seed mix for the more mesic parts of the site, and it has done very well. It grows as a bunch grass and this year is sending up dozens of erect flowering stems, each of which produces seeds. Because the stems are erect, it is easy to bring together 3, 4, or more flower stalks and cut the heads off all at once. I was able to fill a bucket in a relatively short time. In addition to Virginia wild rye, the East Basin has a lot of another rye, Elymus riparius, which we did not plant. We call it woodland rye (it grows in partial shade in our savannas), although it is more commonly called riverbank rye. How did this species get in the East Basin since we did not plant it? Here is my explanation. Before we restored it, the East Basin had become fairly wooded, although in earlier years it had been a savanna or open woodland. E. riparius had probably been common at that time, but by the time we started restoration the habitat had become quite shady, so this rye grass was suppressed. It would have been growing vegetatively but not flowering, so we would not have noticed it. But once we brought the sunlight back in, it started to flourish again, as the photo below shows. When seed collecting, how do you tell virginicus from riparius? The seeds themselves are quite different since riparius seeds have lots of short hairs and have quite long awns, whereas virginicus seeds are hairless with short awns. However, when seed collecting you need a simpler way of distinguishing them. As the photos show, the flower heads of virginicus are fairly small and stand quite erect, whereas those of riparius are large and bend over. Once you have the hang of it, you can move through an area and focus only on your target species. Even if two bunches are side by side, there is no chance of making a mistake. Can you tell which is which in the photo below? The photo above is of a prairie and savanna remnant developing on a steep south-facing slope with a thin, stony soil. Even without doing any quantitative measurements, it is easy to see that the prairie grasses (primarily little bluestem and Indian grass) are sparse or absent under the shade of the woody plants. At one time, this whole hillside was wooded, and in the first few years after it was cleared the prairie grasses were sparse or nonexistent. Cutting with herbicide treatment and annual controlled burns eliminated most of the woody plants and eventually the grasses recovered. Today they are well established, but only a few years in the absence of burns and they would be struggling again. Prairie grasses interact with woody vegetation in complex ways, but one of the principal effects is on available light. Prairie grasses require close to full sunlight to develop to their fullest extent and even a little bit of shade will have an effect. 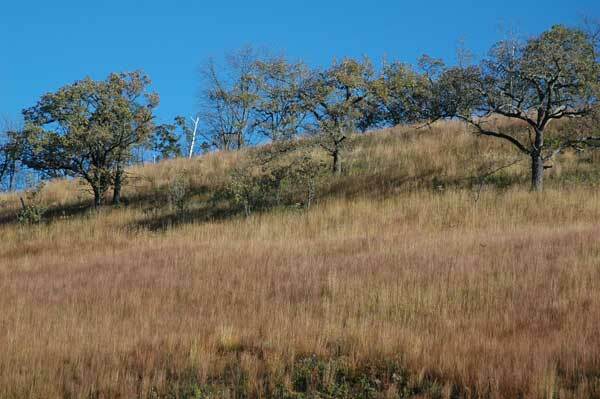 Since the principal fuel in this hillside is grass, if the grasses are inhibited woody plants can get started. On the other hand, if burns are skipped for a few years woody plants will start to return, and once they start to shade out the grasses, even more woodies can grow, leading to even less grass, which leads to more woodies. This is a classical positive feedback loop. Since the grasses are the principal fuel, when they are inhibited there is progressively less fuel. Eventually a stage is reached where grasses are gone and only woodies are present. Research has shown that this positive feedback mechanism operates all over. It has been reported in the Chihuahua desert, Texas range country, Kansas prairie, and African savannas. All of these habitats depend on fire for maintenance. 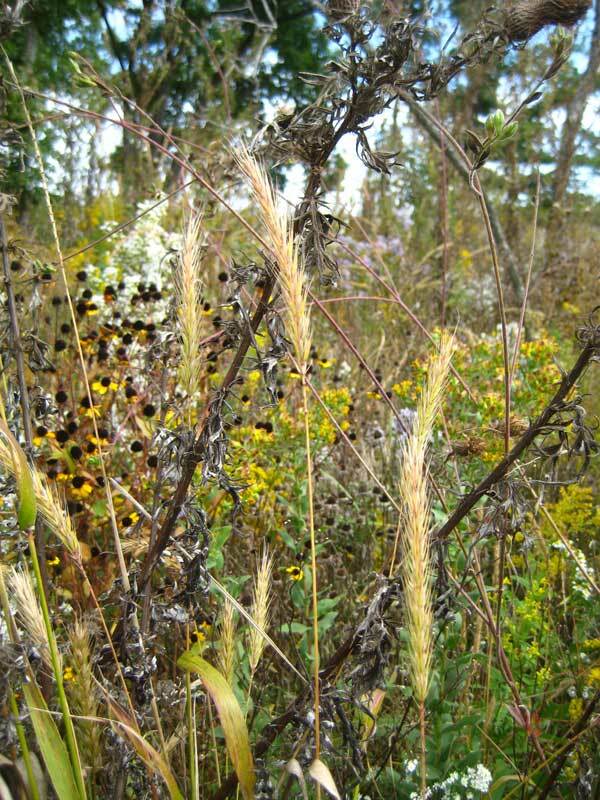 September ushers in seed collecting as a major restoration activity. Suddenly lots of species are ready to collect, and from now until early November each week will bring on several species to collect. Kathie loves seed collecting and has become a real expert. How many people do you know who can identify prairie plant species from single seeds? Sunday at Black Earth Rettenmund Prairie a group of volunteers collected prairie cinquefoil, purple prairie clover, prairie thimbleweed, big bluestem, lead plant, showy sunflower, Kalm's brome, among others. The photo shows Kathie explaining how to recognize cinquefoil. Most of us also collected sweet clover, not to save but to bag and dispose of. Although sweet clover eradication was a major activity at Rettenmund Prairie in June and July, there is always the problem of fall regrowth, mostly small flowering plants that are difficult to find but need to be eliminated. Yesterday at Pleasant Valley Conservancy the weather was stupendous and we had a very enjoyable afternoon seed collecting. Among others we collected Virginia wild rye, woodland rye (Elymus riparius), woodland brome (Bromus latiglumis), prairie cinquefoil, wool grass, dark green bulrush, purple prairie clover, and panicled tick trefoil (Desmodium paniculatum). Anyone interested in helping collect seeds (or learning how) can join us for our big seed collecting extravaganza on Sunday, October 9, 2011. We will be at Pleasant Valley Conservancy in the morning (9:30 until noon). 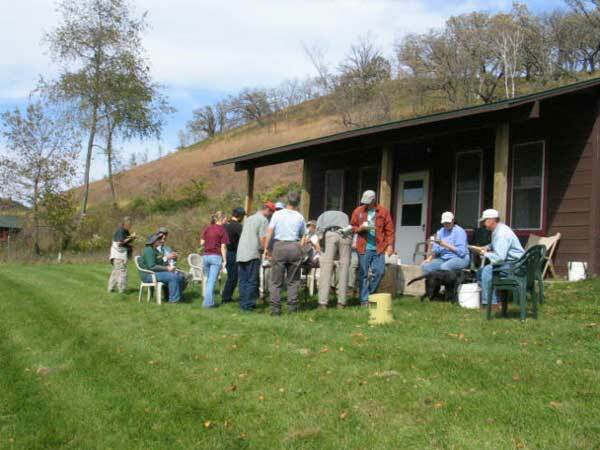 After a free lunch at the cabin (see photo below), we will move to Black Earth Rettenmund Prairie for the afternoon (1-4 PM). Folks can come for half or all day. This will be the fifth year that we have hosted this event, and it seems to be popular. (Come rain or shine!) For details, send an email to pvc@PleasantValleyConservancy.org, or contact Kathie at 238-5050. Even though we do not have any major prairie plantings upcoming, we always have need for seeds to plant in bare areas resulting from various restoration activities. 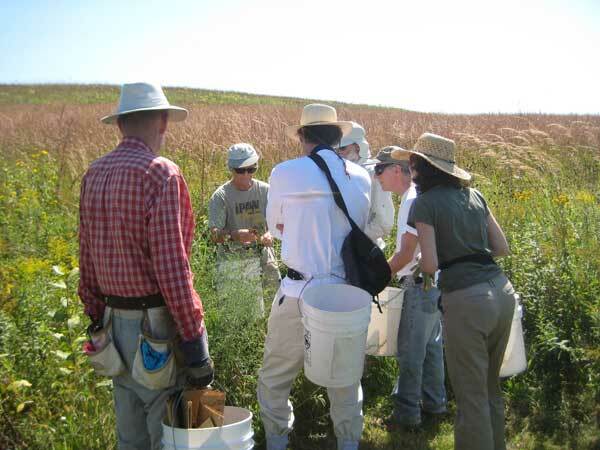 Check the Pleasant Valley Conservancy web site for a list of recommended seed collecting dates. We have now created a new trail map that provides a more complete view of Pleasant Valley Conservancy. This map is available in a dispenser at the trail entrance. The map is similar to the Management Map that can be downloaded from our web site, with a few updates. The main advantage of the new trail map is that it can be picked up at the Conservancy entrance and carried along on a hike. If you don't want to keep it, you can return it to the dispenser when you are finished hiking. It has been printed on high quality paper (not a newsprint version!) and can be useful when studying the flora and fauna. Lots of people don't seem to need a trail map, and enjoy wandering. However, we have had requests for a map, and I finally found time to put this together. 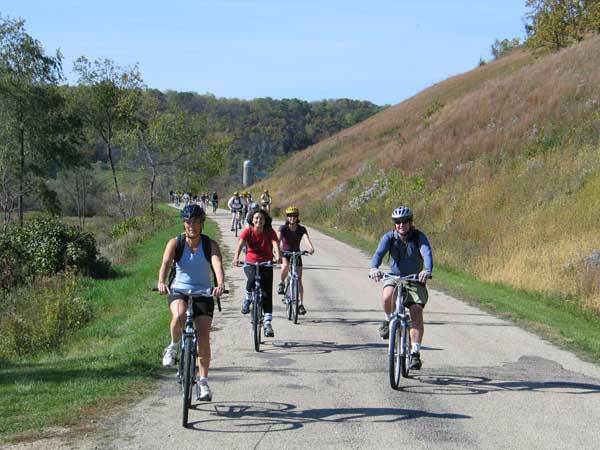 Another new feature is a bicycle rack at the Conservancy entrance, so that bikers can make a visit. Pleasant Valley Road and the other roads in these hills are favorites for road bikers, and it seemed to me that bikers might like to walk for an hour or two during a day's bike visit. 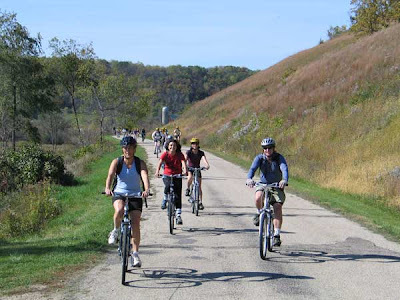 I used to be a road biker in my younger years and know how enjoyable a bike tour can be.